If you could name one game-changing feature that Samsung failed to show during its unveiling of the Galaxy S5, what would it be? Maybe, QHD display? Or innovative, all-metal design? Or baby monitor? OK, so no one was hoping that the GS5 could double as a baby monitor, but apparently it does just that. 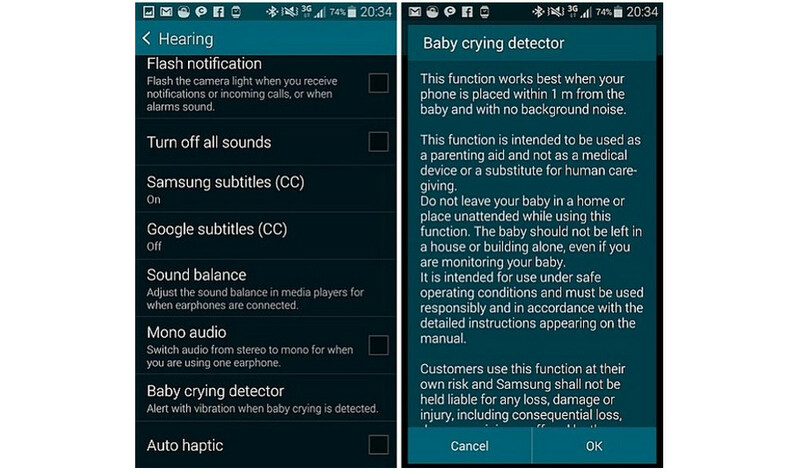 Tucked inside the Accessibility menu of the phone, there is an option with a box that reads “Baby crying monitor.” The feature, at least according to the screenshots included in this post, will detect if your baby is crying and then alert you with a vibration through what we can only assume is a Gear smartwatch. I would also assume that there is some sort of companion app that can be installed on the watch that communicates with the phone, though I can’t confirm that until I get a unit in-hand, full time. The “Baby crying monitor” is as you can imagine, filled with warnings, like this is not to be used “as a medical device or substitute f0r human caregiving.” Samsung also notes that it won’t be held responsible should you suffer “consequential loss” while using your Galaxy S5 as a baby monitor. As long as you place the phone within 1m of the baby and have no background noise, it could be an option should you need a baby monitor in a pinch. Maybe? Anyone willing to give it a try with their new phone (once it launches April 11)?